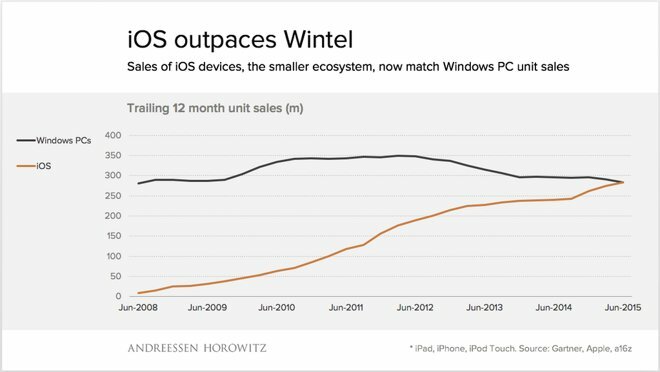 Sales of Apple's iOS lineup —comprised of the iPhone, iPad and iPod touch —has now matched annual sales of devices running the ubiquitous Microsoft Windows platform. The new milestone for Apple was noted this week by analyst Benedict Evans, culled from data provided by Gartner, Apple, and a16z. It shows that while annual Windows PC sales have fluctuated around the 300 million mark since 2008, iOS devices have continued their meteoric rise. Though iOS devices include the iPad and iPod touch, recent growth has been driven solely by the iPhone. Sales of the iPad and iPod, meanwhile, have shrunk in recent years, but tremendous iPhone growth has carried the iOS platform to new heights. Annual sales of devices running Google's Android platform had already surpassed Windows PCs long ago— in March of 2012. The total install base of Windows machines remains much larger, at 1.5 billion. But PCs also have a much longer upgrade cycle than mobile phones, helping to push annual iOS sales even with Windows computers. iPhone sales alone have reached more than 222 million units over the last four quarters. Apple also revealed in January that it shipped its one-billionth iOS device in the holiday 2014 season. Apple Chief Executive Tim Cook has made it clear that he sees plenty of room to grow iPhone sales going forward, even after the device has reached such heights. In his company's quarterly earnings conference call earlier this week, he revealed that just 27 percent of the iPhone installed base has upgraded to the iPhone 6 series, suggesting that the anticipated "iPhone 6s" may not lose momentum.